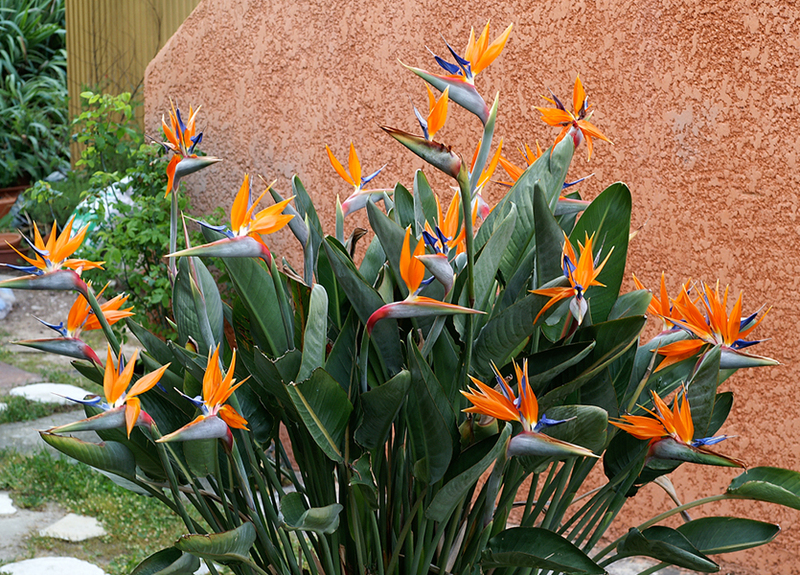 Strelitzia reginae is a monocotyledonous flowering plant indigenous to South Africa (the Cape Provinces and KwaZulu-Natal). 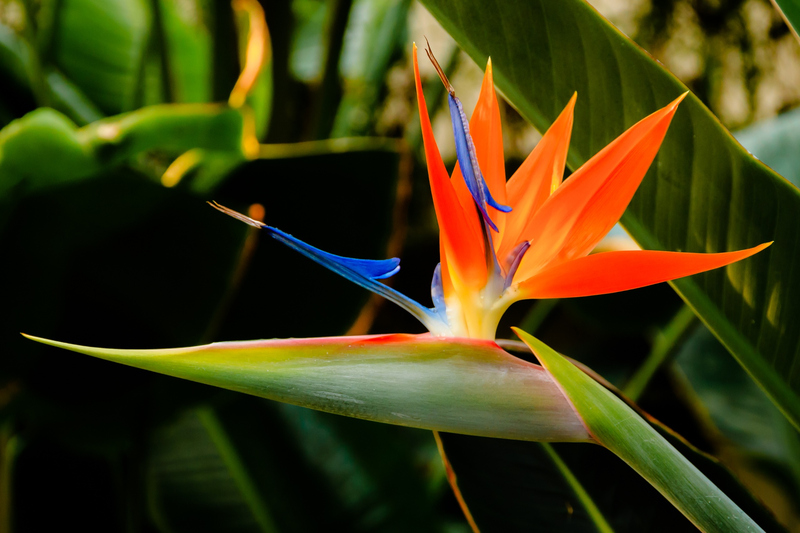 Common names include Strelitzia, Crane Flower or Bird of Paradise, though these names are also collectively applied to other species in the genus Strelitzia. Its scientific name commemorates Charlotte of Mecklenburg-Strelitz, queen consort of the United Kingdom, wife of H.M. King George III. The species is native to South Africa but naturalized in Mexico, Belize, Bangladesh, Madeira Islands and Juan Fernández Islands off the coast of Chile. The plant grows to 2 m (6.6 ft) tall, with large, strong leaves 25–70 cm (9.8–27.6 in) long and 10–30 cm (3.9–11.8 in) broad, produced on petioles up to 1 m (39 in) long. The leaves are evergreen and arranged in two ranks, making a fan-shaped crown. 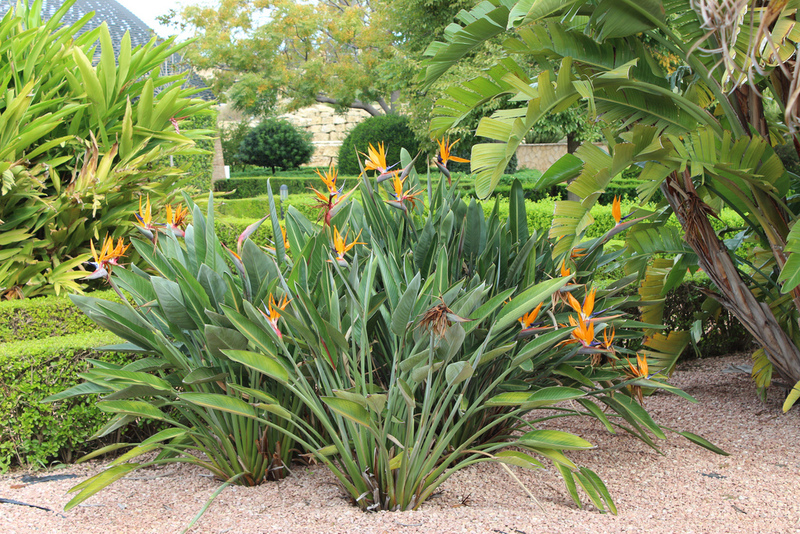 The flowers stand above the foliage at the tips of long stalks. The hard, beak-like sheath from which the flower emerges is termed the spathe. This is placed perpendicular to the stem, which gives it the appearance of a bird’s head and beak; it makes a durable perch for holding the sunbirds which pollinate the flowers. The flowers, which emerge one at a time from the spathe, consist of three brilliant orange sepals and three purplish-blue petals. Two of the blue petals are joined together to form an arrow-like nectary. When the sunbirds sit to drink the nectar, the petals open to cover their feet in pollen.